The Hamax Smiley baby bike seat is an ergonomic and safe seat for babies and children. The Hamax Smiley baby bike seat is an ergonomic and safe seat for babies and children. The carrier is approved for children from 9 to 22 kg or app. 1 -5 years of age. The Hamax Smiley has a special practical patented safety belt. A double buckle system makes an easy fit. The bike seat is developed with help from children representing the target group and has resulted in a safe, comfortable and practical seat. The child seat is easily mounted to the frame of the bike. For safety reasons, an indicator system will tell you when the seat is correctly mounted. Only four screws to fit it to your bike. 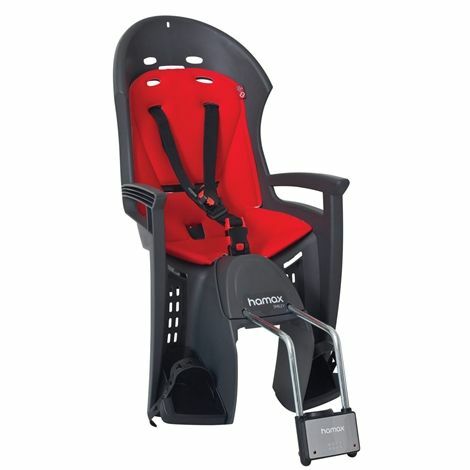 Please see below for delivery options for Hamax Smiley One Point Fitting Rear Mounted Seat.